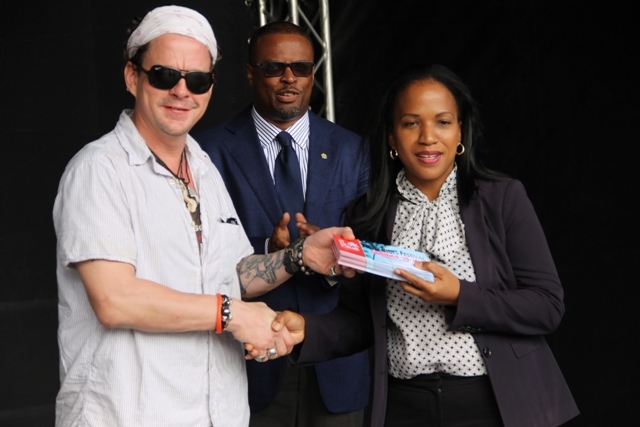 NIA CHARLESTOWN NEVIS (April 12, 2016) — A number of nurses and teachers on Nevis will have the opportunity to attend the opening night of the Nevis Blues Festival 2nd Edition, on April 14, 2016, at Oualie Bay, thanks to a gift from the organisers. At a small handing over ceremony on the site of the three-day festival, Hon. Mark Brantley, Deputy Premier of Nevis and Minister of Tourism and Health thanked Richard Pavitt and John Yearwood for the gift. “I think it’s very magnanimous of the organisers to offer these free tickets to our nurses and our teachers, who, as we know labour hard for us. They provide essential services to the community. “It is my hope that this very generous gesture of over 200 tickets being made available and that those who receive them will come out and support this very important festival,” he said. 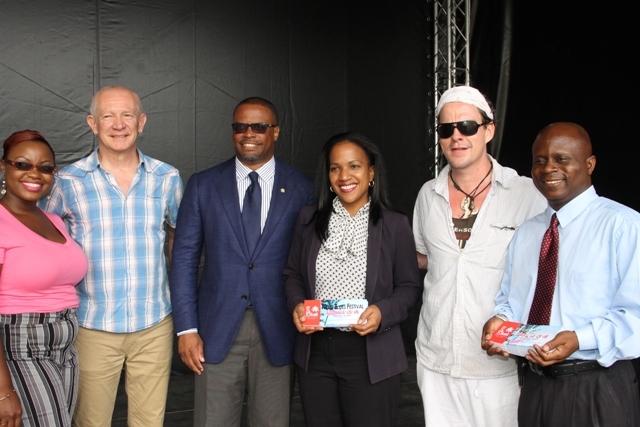 Mr. Brantley expressed hope that the festival which the Ministry of Tourism and the Nevis Tourism Authority (NTA) continues to throw their support behind, becomes an annual fixture on the calendar of events on Nevis as it continues to grow in size, popularity and reputation. He used the opportunity to invite the public to support the venture. 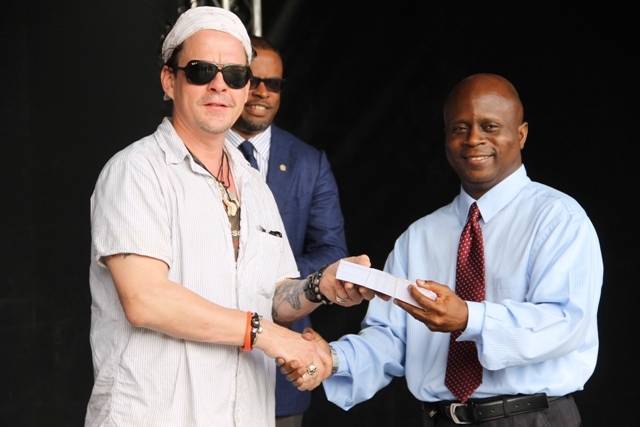 Mr. Pavitt who was accompanied by Blues star Ian Seigal, and chairman of the local committee Shari Greaves, said the gift is intended to give back to the island, especially those who are in the vocational fields of nursing and teaching. In response, Permanent Secretary in the Ministry of Health Nicole Slack-Liburd wished the festival success on behalf of the ministry and commended the organisers for their partnership and public recognition of the nurse’s efforts. She said the health care workers on Nevis continue to be at the frontline at both the Alexandra Hospital and the six public health facilities on the island. Wakely Daniel, Permanent Secretary in the Premier’s Ministry with responsibility for Education, expressed thanks on behalf Hon. Vance Amory, Premier of Nevis and Minister of Education, the Ministry and Department of Education for the gesture. Daniel who has been a teacher for 21 years said he was pleased some teachers would have the opportunity to attend the festival. “It is one thing to hear about something. It is one thing to read about it but it takes you to an entirely different level, when you experience it and these tickets will allow our teachers to attend the Blues Festival and experience it, an experience, to some of them, to a brand new genre of music. “It will expand their horizon and it would give them the opportunity to promote Blues and your festival among the children of Nevis in the classroom and of course the wider Nevis populace,” he said.